Our sunglasses and eyeglass frames are born from 27 thin layers of exotic woods. The creative choice to make fashion eyewear this way is driven by the originality and superior technical performance we achieve. Our proprietary manufacturing process lets us highlight each wood's most desirable characteristics like vibrant color, flame figurations or open-grain textures. Presenting the unique, natural essence of each wood species means every frame becomes a warm, natural, one-of-a-kind expression of style. We take sustainability seriously. Santa Barbara’s seaside location means we know the real cost of plastics and pollution. Keeping plastic out of the precious Pacific Ocean is our cause. We conceived Morning Wood with an eco-luxury point-of-view and spent six years developing end-to-end tooling and manufacturing that lives lightly on the planet. Our innovative, limited production products have a natural lifetime quality that is the opposite of disposable. Our unisex frames lead the way in innovation, fashion, fit and style. They’re designed by one of the industry’s leading voices for joyous use by everyone. Your frames will look like our product photos. However, natural wood variations mean no two frames are ever exactly alike. Each frame is hand assembled, sanded and polished with sustainable beeswax and orange oil, then buffed to a beautiful matte finish. These fabulous frames can accommodate prescription lenses. We didn’t just invent a new frame, we invented an entirely new technology for precision eyewear. The secret is combining laminated wood veneers, custom tooling technology and talented craftspeople. The result is an exclusive, zero-tolerance wood frame that insures perfect fit and form. Laminated wood is stronger, lighter and more durable than plain wood itself. Interweaving wood veneers allows us to highlight the most stylish expression of a tree's colors, patterns, textures and graphic qualities. 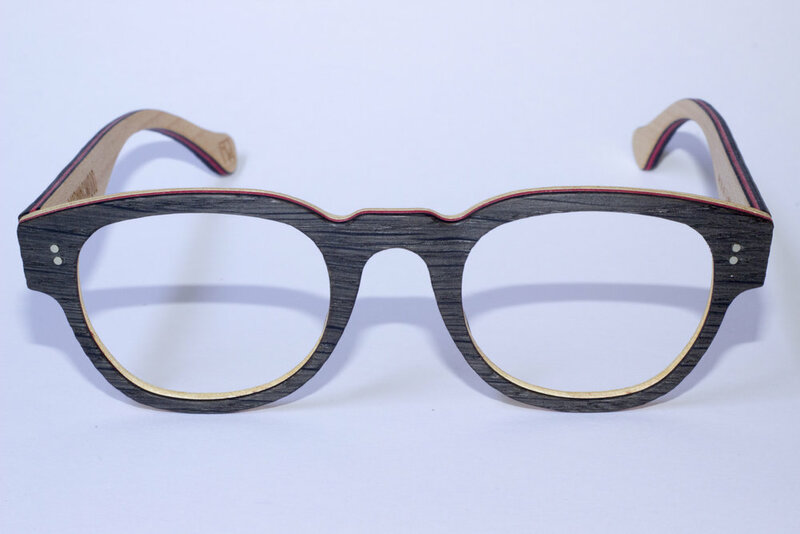 Each frame starts with 27 layers of various species of woods, which are precision laser cut and laminated together by hand. Our proprietary software has over a million lines of code to communicate with our customized tooling equipment. The result is a frame that is unique to the marketplace...and you. We developed Morning Wood Glasses for perfectionists. Because we make these innovative frames rather than buying or importing them, it took six years of meticulous work to create and stablize every element. The few components we don’t make are sourced from the world’s best. Namely, stainless steel Italian hinges are hand riveted in place. Polarized sunglass lenses have zero distortion and the best sun protection. California’s Santa Barbara is a magical city-by-the-sea. Situated between the central coast and Santa Ynez mountains, life here is ennobled by horses, vineyards, flowers and the majestic Pacific Ocean. As one of the original California mission towns (1786), we have a rich cultural history. More recently, we’re a vibrant blend of tastemakers from entertainment and technology together with those who value living well. Morning Wood Glasses are designed and hand-made in Santa Barbara, USA. Available at select eyeglass retail stores.